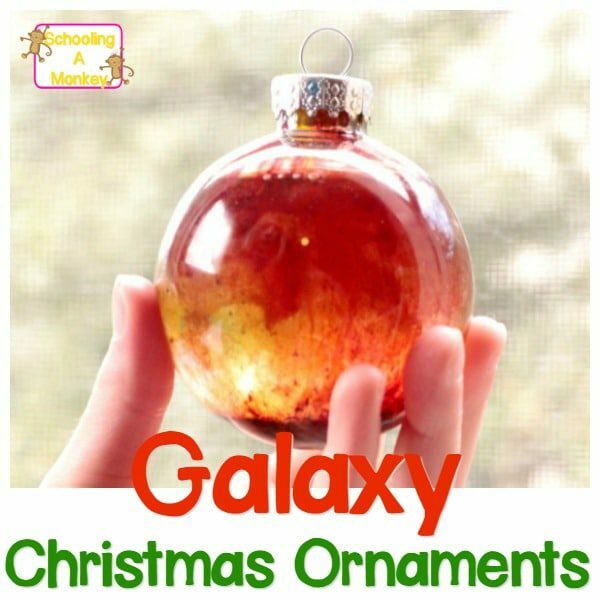 Combine a love of Christmas and a love of the galaxy in a STEAM exploration of galaxy Christmas ornaments. 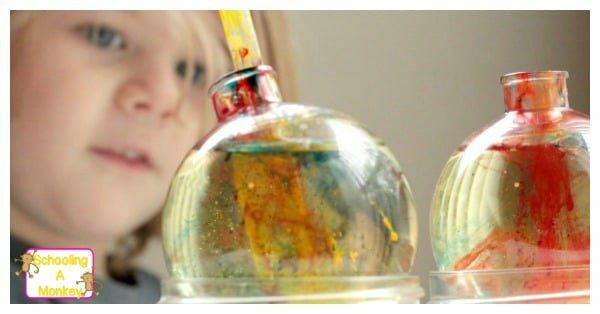 Kids will love this simple STEM activity! We watched a video the other day of a color mixing laminar experiment a few days ago, and I was completely fascinated by the process. 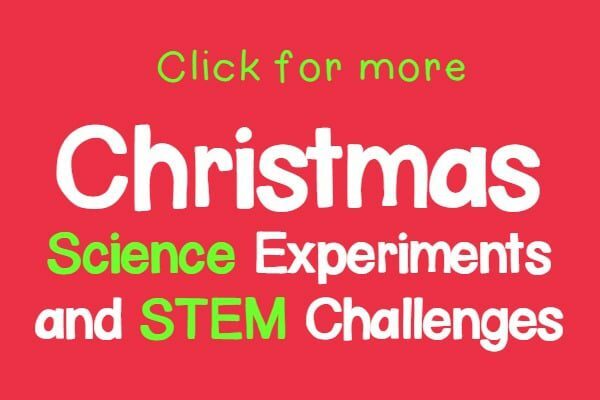 I tried recreating the Christmas STEM experiment at home, but I wasn’t able to and we ran out of corn syrup. But all the experimentation reminded me of a galaxy, which is how this experiment was born! 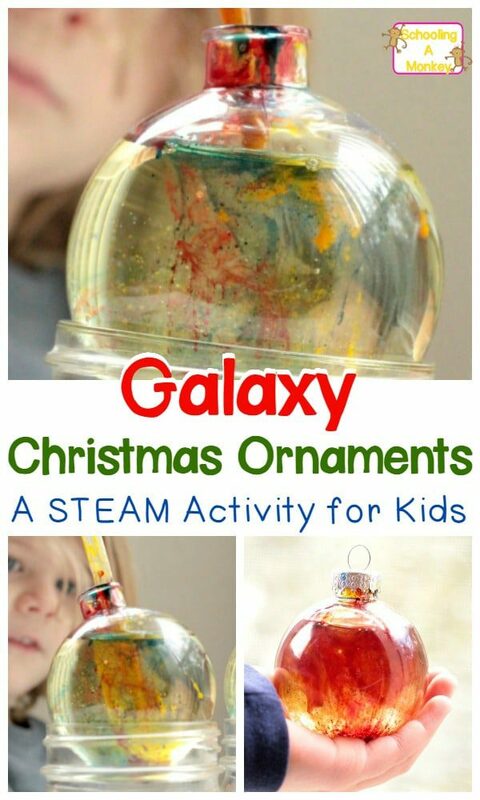 The kids loved both the “failed” experiment and the Christmas galaxy ornaments. 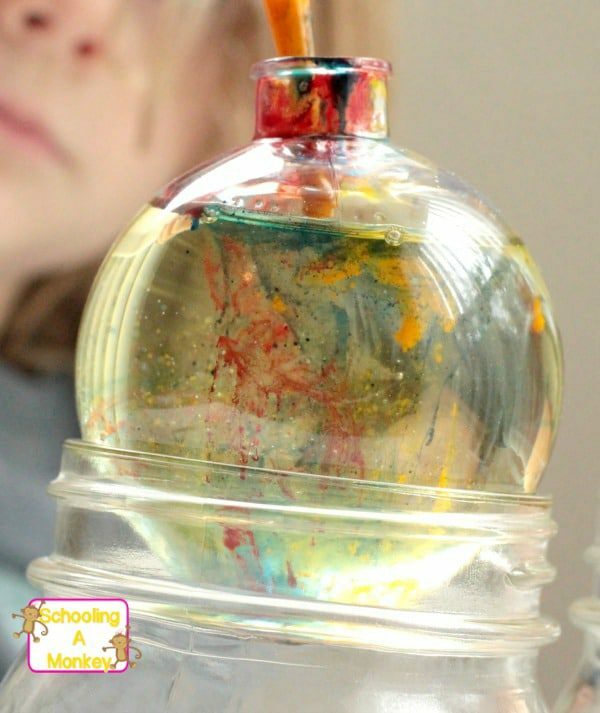 Try this experiment to make your own galaxy in a Christmas ornament! Please note, these ornaments are for play only and are not meant to be hung on the Christmas tree. 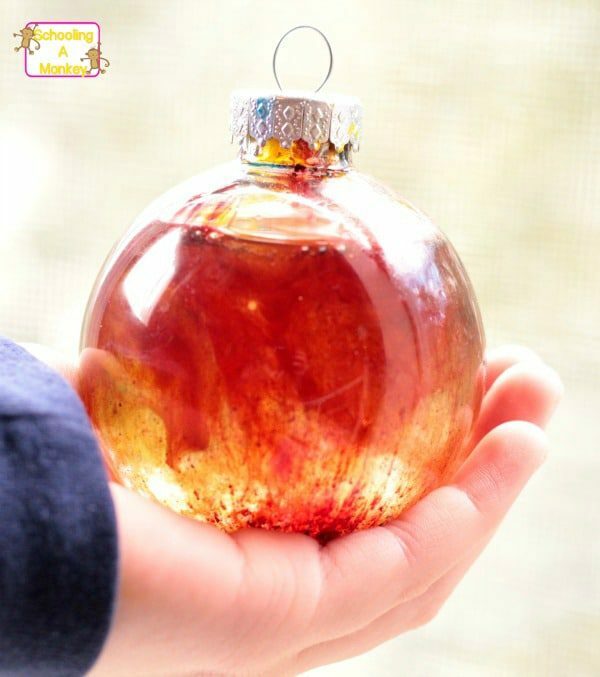 Fill your Christmas ornaments with vegetable or mineral oil. 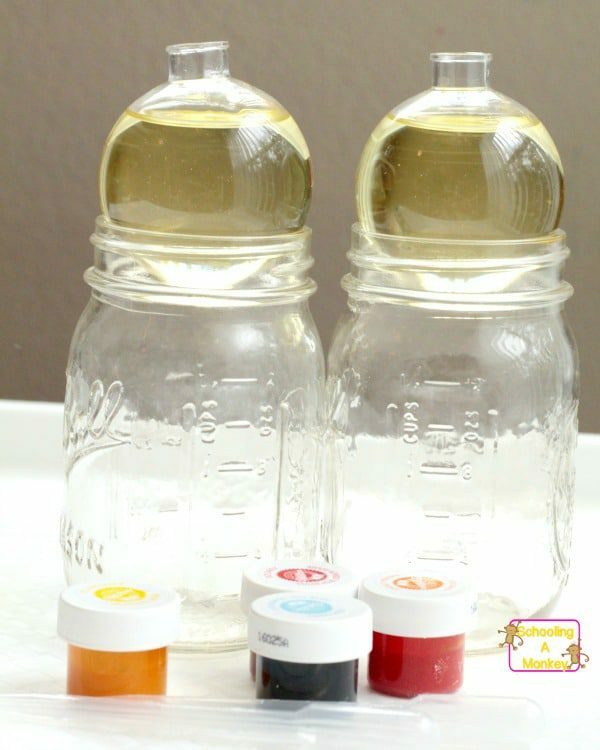 Place the ornament inside a mason jar for support. 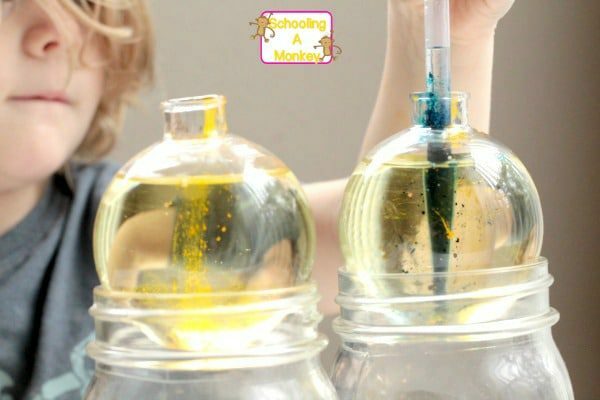 Dip the pipette into the color of your choice and place the tip near the bottom of the oil-filled ornament. Release the color into the oil. The oil will slowly spread out and fall, creating a galaxy-like effect. Add as many colors as you like. Eventually, the food coloring will fall to the bottom and mix in with the oil (at least, that’s what ours did). But it took quite a long time and the girls were able to create a lot of different patterns with their Christmas ornament globes. We hope to try laminar flow again one day, but the girls thought our substitute was cool enough. They were fascinated with how slowly the color moved through the oil and how they could make different patterns by adding different amounts of color to the oil.